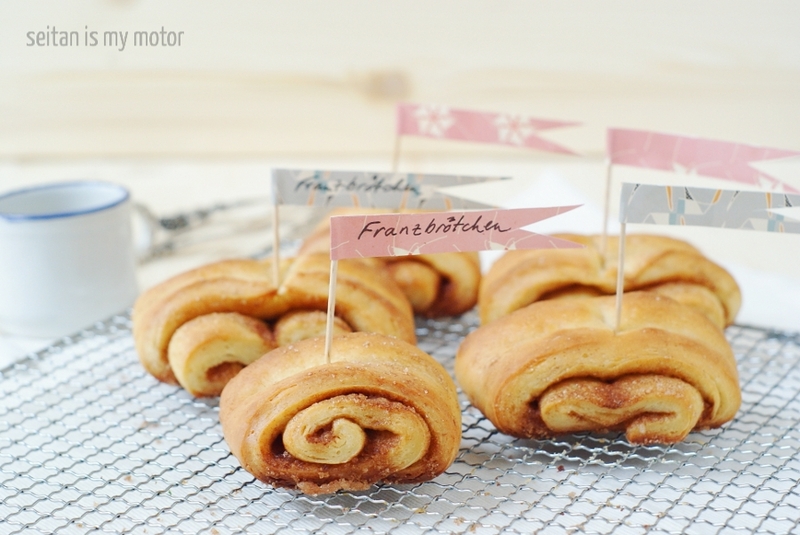 Franzbrötchen are a delicious cross between a danish and a croissant. (Franz is a German name, but it’s also related to französisch [=French]. Brötchen [or Broetchen if you cannot find the umlaut letter on your keyboard] means little bread or roll.) They are soft, buttery, and crispy and they are a popular breakfast item. Of course they make a decent dessert, too. Franzbrötchen are native to the wonderful town of Hamburg, (Every time Hamburg is mentioned I have to think about this great song by the German band Lassie Singers) but if you are lucky you can find them in other places as well, especially in Northern German cities. They are very similar to Korvapuustit, Finnish cinnamon rolls. I have only eaten Franzbrötchen a couple of times, but definitely often enough to know that I messed up this recipe a bit. The instructions weren’t clear enough for me and I probably should have rolled out the dough thinner. The recipe said “1 cm thin” , but I think 1/2 would have been more accurate. This is probably obvious to those who make these pastries more often, but not for a Franzbrötchen newbies like me. These rolls need more layers, so that you can fill them with more delicious fat, sugar, and cinnamon. But even though they don’t look perfect, they definitely taste amazing. Like a crispy cinnamon bun. The perfect weekend breakfast or brunch food. Or a wonderful snack treat. Combine flour, yeast, and milk in a bowl. Let sit for 5 minutes. Add oil, sugar, and salt and knead the dough for 5 minutes. Shape into a ball, place in the bowl, cover with plastic and let sit at room temperature until the dough has doubled (about 90 minutes). Preheat the oven to 180°C (350°F). Line a baking sheet with parchment paper. On a lightly floured surface roll the dough into a large rectangle. Mine was 28 x 23 cm (11 x 9 inches), but as I said, the dough came out a bit too thick. I recommend to make the short side a bit longer, if that makes sense. Cream together coconut oil, sugar, and cinnamon. Spread onto the dough. Roll into a log, starting from the short side. Cut into six equal pieces. To shape the rolls press the handle of a wodden spoon into the middle. It’s hard to explain, here’s a picture. (Scroll down a bit.) Place the rolls on the baking sheet and bake for 15 minutes. During baking the filling will melt and partly escape the rolls to spread over the baking sheet. Brush the rolls with that liquid coconut oil, sugar, and cinnamon mixture and bake for 3 more minutes. Remove and let cool on a rack. If you want to freeze these, it’s best to prepare them and freeze them unbaked. Once you decide you want to bake them, take them out of the fridge and place the frozen rolls in the preheated oven. Bake a couple of minutes longer, until golden brown. That was the last entry for this first week of veganmofo. I am taking the weekend off. Next week I have some slightly “lighter” desserts planned. have a great weekend! Thanks Erika! Let me know if you get a chance to make them. Ich freu mir gerade ein Loch in den Bauch, dass ich deine Webseite gefunden hab. Ich bin zwar kein Veganer, esse aber keine Milchprodukte und vermisse die Heimatbackerei aus Deutschland doch schon so manches mal. Bin über das Donauwellenrezept hier her gestolpert, hab aber nun die Franzbrötchen als erstes gemacht, weil ich da gerade alles zu Hause für hatte. Ich glaube ich hab meinen Teig zu sehr ausgerollt und sie sehen ein wenig anders aus (liegt bestimmt am Vollkornmehl) aber mein Haus riecht fantastisch und ich freu mich drauf gleich eine warm zu essen. Tolle Rezepte!!! Just made these for breakfast, ran out of sugar so used maple syrup for the filling. Delicious, great recipe (and my first foray into yeast baking that has gone right). The mixture of coconut oil, sugar, and cinnamon that you spread onto the rolls will melt during baking and it will partly escape and spread all over the baking sheet. You use that to brush the rolls. You can totally leave out this step, if you want. Sorry I didn’t word it better the first time. I hope it is clear now? OMG someone so needed to veganize these! I see them all over Berlin, they are an extremely popular breakfast item and I always wondered whether they were easy to make at home. Awesome theme by the way! I’ll be following closely. Are they sold by Kamps there? The layers are impeccable and the cinnamon filling so tempting. Another recipe bookmarked! Oh how perfect! I love cinnamon rolls. Yet another of your creations added to my must-make list! Not perfect? I think they look great! All cute and delicious looking. I’m going to have way too many of your recipes bookmarked by the end of the month! oh my gosh, your theme is just blowing my mind. your pictures are glorious and the recipes are so overwhelming. I want to try every single recipe you are posting. Maybe next Mofo, my theme will be recooking all these great creations! ha ha. :) Anyhow, I am loving it, and cant wait to try some of these out, hopefully soon! I’m loving all the recipes you’re posting! Looking forward to next week already. 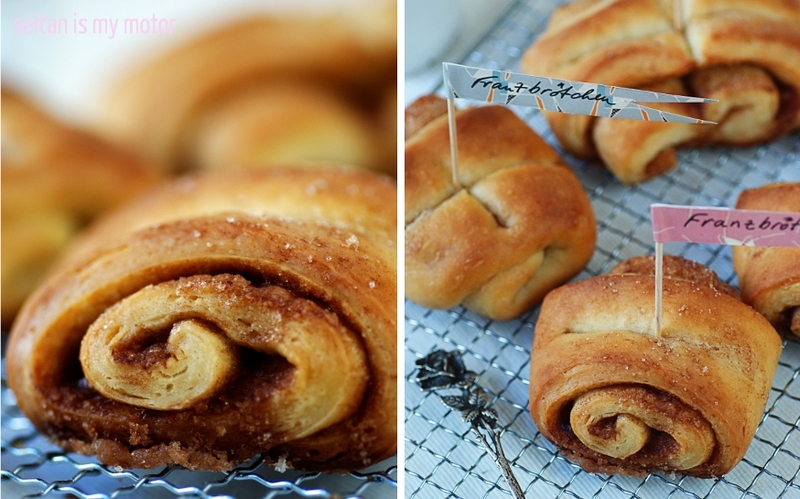 I’ve only tried American cinnamon roll recipes so far so I’d love to try these too! Perfect timing…the weather is really cooling off so it’s time to start baking breakfasts again. Thanks for the recipe! oh my goody goodness these look amazing. I could definitely go for one or 2 of those right now. These look amazing, I love cinnamon rolls. I wish I was able to taste all of these amazing things you are making. Ugh! These are lovely. I like dense layers in my cinnamon buns. I’m generally less interested in the filling and more worried about eating all the delicious bread-y parts. Oh man, I love any kind of pastry but I just don’t have the patience! Have a wonderful weekend off. Oooh! I have been craving cinnamon rolls and searching for a good recipe. Thank you! Aw! These are super cute, I love them! These are beautiful — a testament to the glory of gluten. Oh, these are so adorable especially with the little toothpick flags! One day I will get over my fear of dough making so I can make cinnamon rolls like these. Honestly, I really have to try not to drool when I’m looking at your recent posts.